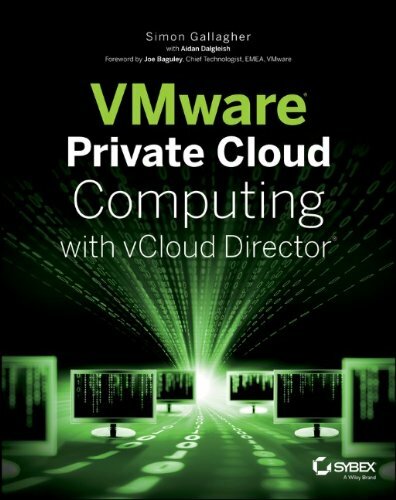 If you came to London VMUG last week and were one of the people who attended my vCAC real world session, you’ll have seen the demo gods not shining kindly on me as I couldn’t logon to my vCAC demo environment. After some further digging I found that I could logon to the root org https://vcacserver.net/shell-ui-app/ using the administrator@vsphere.local account but nothing else and I couldn’t logon to any of my tenant organisations despite the credentials being 100% correct. After some digging this seems this is a sort of time-bomb bug that has only been recently discovered, it occours after 90 days and will stop tenants being able to login using LDAP credentials. When attempting to log into a tenant, a blank page is displayed with a Submit button in the upper left corner. You receive a System Exception error when accessing the tenant identity store configuration page and the identity store configuration may have disappeared. You cannot log in to a tenant using an LDAP account. 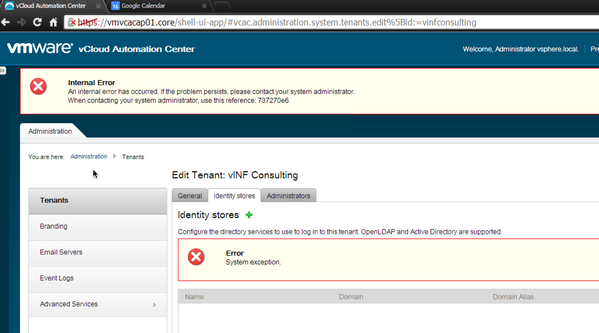 You are unable to add a new identity store configuration to the affected tenant. The tenant identity store disappears from the SSO Administrator login. I assume a fix will follow in due-course. In my case I worked out that it was exactly 90 days until about 15mins before my vCAC session started last Thursday – which is bad-timing taken to the extreme. So, in summary if you have a vCAC implementation that you deployed since 6.0.1 came out you’re going to run into this install date +90 days. if you used Kenny Colemans or Jad’s guide to setting up your POC this is the scenario you will have – the vCAC ID appliance uses it’s SSO to talk to vCenter and this is the internal password that will expire when you hit 90 days. Even though my tenants are logging on using an external, unrelated Active Directory domain via LDAP this bug will still hit you.